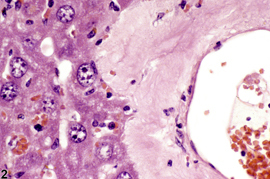 Amyloid (arrows) in a male Swiss-Webster mouse from a chronic study. 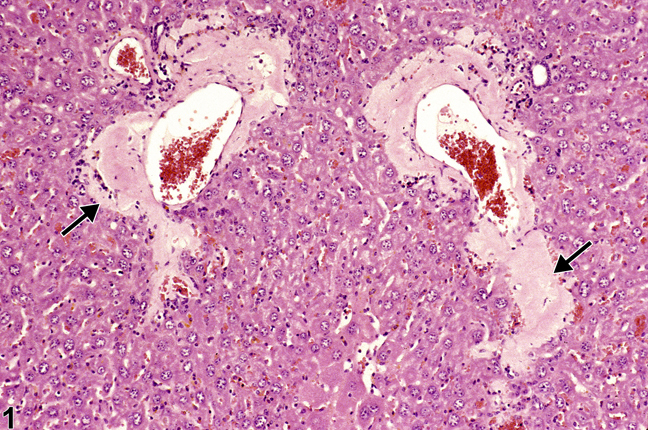 Amyloid in a male Swiss-Webster mouse from a chronic study (higher magnification of Figure 1). Amyloid ( Figure 1 , arrows) occurs as a result of cells not being able to eliminate insoluble misfolded protein. It can be associated with overproduction of acute-phase protein in chronic inflammation. Amyloid deposition is rare in rats but is a common age-related change in some mouse strains that presumably have a genetic predisposition. 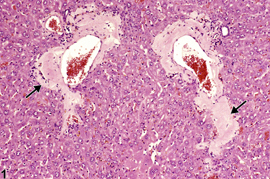 Amyloid in the liver is considered secondary amyloidosis and is seen within sinusoids and blood vessel walls. 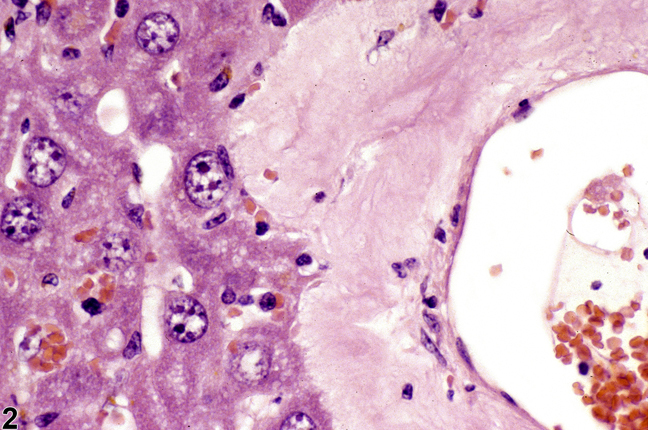 Histochemical (e.g., Congo red) and immunohistochemical stains are useful for definitive diagnosis. Amyloid should be diagnosed and given a severity grade whenever present. Aigelsreiter A, Janig E, Stumptner C, Fuchsbichler A, Zatloukal K, Denk H. 2007. How a cell deals with abnormal proteins: Pathogenetic mechanisms in protein aggregation diseases. Pathobiology 74:145-158. National Toxicology Program. 1993. NTP TR-443. Toxicology and Carcinogenesis Studies of Oxazepam (CAS No. 604-75-1) in Swiss-Webster and B6C3F1 Mice (Feed Studies). NTP, Research Triangle Park, NC.